For investors, it seems 2016 is the year of the altcoin. Bitcoin has long dominated the investment space with over 90% of the market cap as it built a following as a payment network and the most secure immutable ledger. 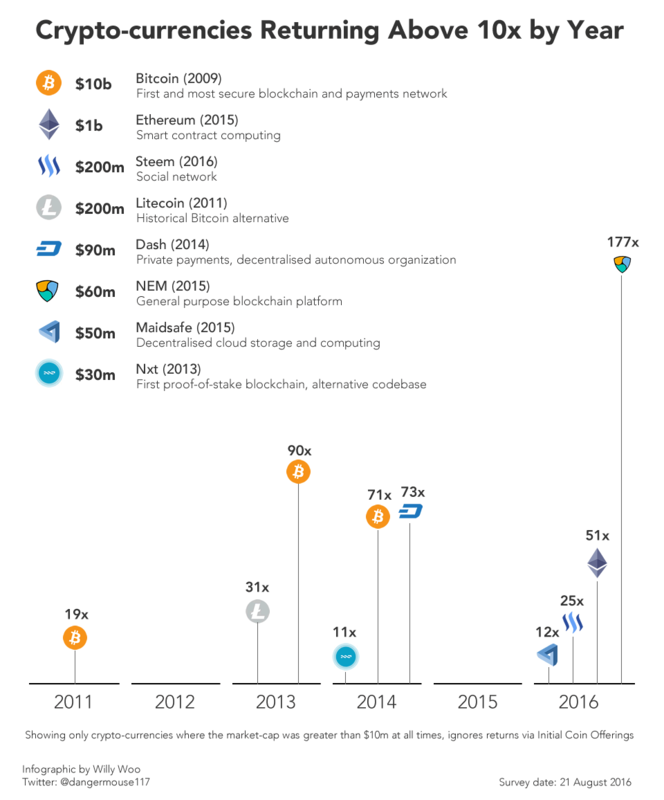 Of course Bitcoin has been challenged by alternatives since 2011 with hundreds of cryptocurrencies arriving onto the market, each vying for different use cases to win markets beyond what that Bitcoin offered. Historically they haven’t made a dent compared to Bitcoin. I made an infographic a few weeks ago summarising the outright investment winners out of the ramble of competitors, scams and shitcoins. What showed up was this alt space is really hotting up, especially in 2016. Already in just a week after this infographic was made, Monero has won its spot on the 10x list for 2016 with it’s privacy centric technology suddenly grabbing explosive investor attention. If you’re venturing into alt-land, I’d suggest doing some in depth research into each project, maybe even testing each one against some standards, like my 3 golden rules. Run some numbers on suspect market valuations. And above all, holding a diversified portfolio to balance out the risk and volatility. A side note: I saw Roger Ver tweet on this subject this morning. He’s noticed the growth too. But I would say this is not a zero sum game, the alt coins are creating new value in new areas of utility.